Fat Tuesday is upon us! 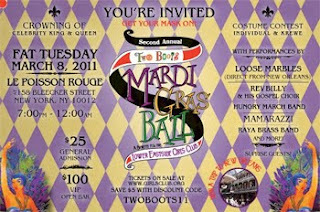 To celebrate Mardi Gras, Two Boots is bringing the Big Easy to the Big Apple. Comedian Murray Hill serves up the laughs while performers Loose Marbles, Reverend Billy & His Gospel Choir, the Hungry March Band, Mamarazzi, and Raya Brass Band will fuse jazz, swing, funk, and brass into a memorable night supporting the The Lower East Side Girls Club. With live art by The Free Art Society, Art In Odd Places and LES portrait artist Anthony Zito; raffles prizes (including a weekend trip to NOLA!) for best costume, individual and krewe; and the crowning of King and Queen of Mardi Gras are plenty of reasons to don a gold, purple, and green mask and embody the colors, the spirit, the pride of New Orleans.